There’s something enticing about the refrigerator case in even the simplest neighborhood grocery stores around here — salad after colorful salad, lined up on the shelf in clear plastic containers like so many jars of candy, ready to be taken to picnics or home for an easy meal. It’s appealing even to me, a do-it-yourself snob. One of the staple salads in such displays is purple cabbage, a lavender concoction that plays no small role in the creation of that rainbow. Doused in mayonnaise, it’s often pungently tart — the vinegar is used to soften the crunchy raw cabbage leaves. 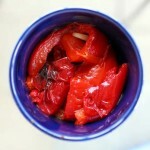 We had just such a container sitting in our fridge for, oh, about a day (what can I say? I like mayonnaise). Once it mysteriously vanished (not like I had anything to do with this), I was left with the option of 1) buying more, and thus getting a small quantity for relatively high expense or 2) making a big vat of it myself. So what happened? I’ll give you two guesses, and the first one doesn’t count. My version has a bit of a twist, though — I roast the cabbage first, which makes the result sweeter than your average purple cabbage salad. Plus, since the cabbage is soft after its time in the oven, the vinegar is purely for flavor, which does away with the astringency that characterizes many commercial salads. 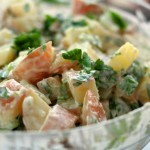 This is a great salad to prepare in large quantities, so you can leave it in the fridge for later. That’s been my cooking strategy of late — making seven or eight different salads over the weekend, when my husband is off work, so I have meals when kiddo and I are home alone on weekdays. It’s quick and effective — roast or steam a massive quantity of vegetables, such as summer squash, eggplant, peppers and green beans, and then mix each one with your choice of tahini/mayonnaise/vinegar/lemon juice if desired. Speaking of which, here’s a quick tip for green beans, which are in peak season but ever-so-time consuming to prepare — instead of trimming off the tips before cooking, why not dump them into the pot and steam as is? It’s a lot quicker, and it’s easy enough to eat around the tips as you go. Most people eat green beans one at a time anyway, right? Now, back to the cabbage. Cut the cabbage in half (for a small head) or into quarters (a large one). Drizzle with a small amount of oil, and roast in the oven at a high temperature (220 degrees Celsius/430 Fahrenheit) until soft — about half an hour. 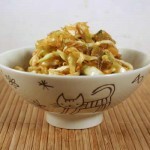 Once the cabbage is cool enough to handle, slice into thin slivers and mix with the mayonnaise, garlic, vinegar and salt. Serve cool. 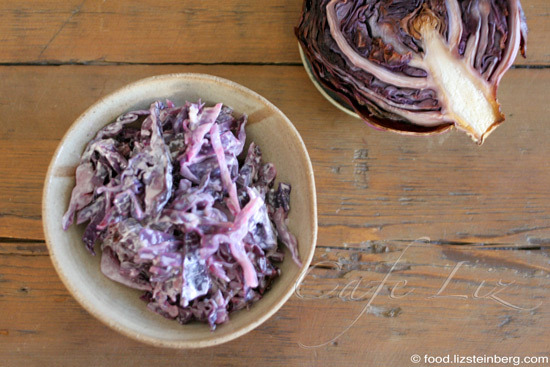 5 Responses to "Garlicky roasted cabbage salad"
Red cabbage is one of my favourites and roasting veggies makes them even more delicious. This sounds like an incredible salad, I think I’d also prefer it with yoghurt, or maybe even t’china. Thanks, Nicole! Hey, if it worked for you, then great. Thanks, Tova. I’ll have to try those other suggestions, interesting that everyone thought the same thing!